I’m proud to introduce my first pattern for sale!!! 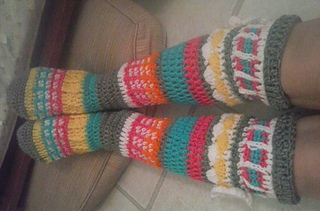 I received a picture of knit knee high socks and I just knew I had to come up with a crochet version. 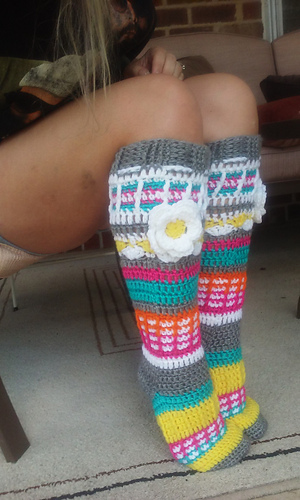 This listing is for the PATTERN only, NOT the finished socks. 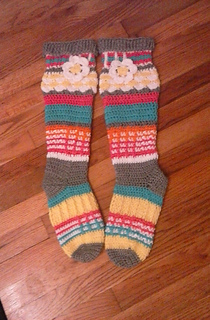 I designed this pattern myself, and would rate the skill level as “Intermediate”. Materials needed are: worsted weight yarn, G6/4mm and H8/5.00mm crochet hooks, scissors, and a tapestry needle. You will need to know how to chain stitch, single crochet (sc), half double crochet (hdc), slip stitch (sl st), as well as how to increase (inc) and decrease (dec). 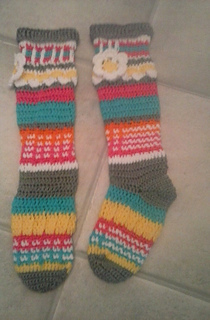 Pattern is for Womens US shoe sizes 5/6, 7/8, and 9/10. 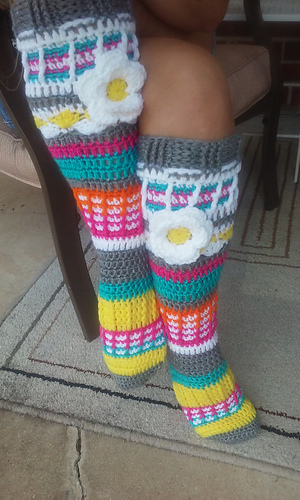 An experienced crocheter will have no problem figuring other sizes. I have made every effort to ensure my pattern is error free, but I am only human. If you find errors, or have problems understanding my pattern, you may convo me through Ravelry.